ComeOn! Esports Review: Fast platform, competitive odds and plenty of event & market coverage. Established in 2010, ComeOn! rose quickly as a traditional online sports betting provider, and was acquired by the publicly-traded Swedish gaming firm, Cherry AB in 2016. ComeOn! runs on the elegant SBTech sports betting platform which you will read about below. ComeOn! has grown significant market share in the Nordic or Scandinavian markets, but is continuing to grown and serve many nations, especially in Europe. ComeOn! offers a nice variety of match betting markets, not simply the match winner or money line. As we approach the start time an actual match, more markets tend to open up, especially for live betting. You will find markets that surround Map winners, Map handicaps and Map Totals (over / under). You can also bet on the over/under Totals for the scores within a given Map. ComeOn! also offers handicap betting, where a given team would need to win their match by a certain number of maps, or they might need to win a given Map by a certain number of points. ComeOn! does not yet offer esports outright winner betting markets for bets on the eventual event champion. If there is a major esports competition that is being played, ComeOn! are probably covering it. Games include but are not limited to: CS:GO, League of Legends, Dota 2, Rainbow Six (R6), Overwatch, King of Glory, Starcraft (SC 2), Rocket League, Warcraft, Call of Duty, Artifact and Team Fortress 2. ComeOn! runs on the fluid and intuitive SBTech sports betting platform. This means you get a seamless experience across all devices. 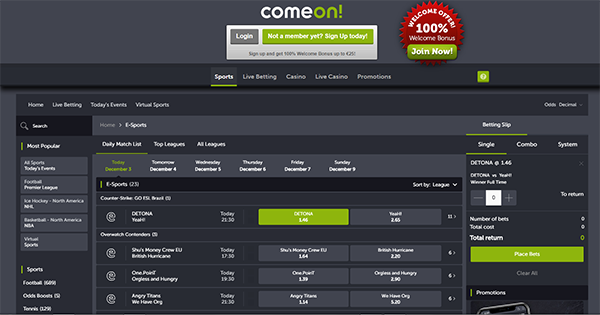 Whether you need to bet from your mobile, tablet or PC, your navigation and betting experience will be very similar. Navigate to esports events through the link found in the sports index on your left or within the mobile menu. (You can also drill down to esports events held in certain countries.) Once you’ve clicked ‘Esports’, you will find upcoming events and tabs and headers that allow you to better-narrow your view of upcoming events. Navigate to events by date, Top Leagues, All Leagues or Live events. Use the search utility to navigate directly to your team name or event terms of interest. ComeOn! provides an account open offer for new customers from most nations that they serve. Terms & conditions apply, 18+. Available banking methods always depend on your location. ComeOn! accepts Visa, MasterCard, Paysafe, Skrill, Skrill 1 Tap, Neteller Siru, Zimpler, Trustly and SMS Voucher and PayPal. ComeOn! offers accounts in Euros, US Dollars, British Pounds, Swedish Kronor and Norwegian Kroner. The bottom line: should you sign up with ComeOn! for esports? ComeOn! is a solid middle-ground choice for players that are somewhere between a serious esports bettor and the occasional recreational bettor. The ComeOn! betting platform is very slick and they offer highly competitive odds on their substantial coverage of esports leagues and betting markets. The only real weakness is a lack of outright winner betting markets for a wager on the eventual champion. Most people are only really interested in markets within matches, so this point may not affect you much.